If you’re missing all your teeth, you might think you’ll never find a solution that feels as good as your own teeth – until now. 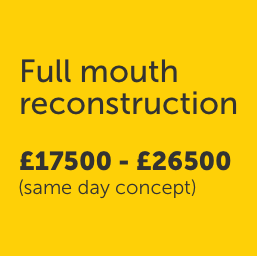 A full mouth reconstruction can give you back the look, feel and function of your own teeth. Experience a whole new you and a whole new smile. Your replacement teeth are firmly anchored in your jawbone. After a short time getting used to them, they’ll feel just like your own teeth. You won’t have to take them out to clean them or go to bed. And they certainly won’t come out by accident. Dental implants stimulate your jawbone like natural teeth. So you’ll avoid bone loss that can happen with missing teeth. And you’ll remain youthful and fuller-faced. Your palate won’t be obstructed so you can taste your food properly again. And because your reconstructed teeth feel and function like your own, you can bite and chew without worrying. Dental implants are as strong and stable as natural teeth. Proper care including regular brushing, flossing and regular checkups will keep them healthy for years, maybe even your lifetime. Visit Bridge Dental & Implant Clinic and meet our Treatment Coordinator. She’ll explain all about the treatment and answer any questions. Your next appointment will be with your dentist who will examine your mouth and explain what your treatment would involve and why. Then, a CT scan and impressions will help us build 3D model of your jaw. This model will be the basis for the design of your new smile. When you’re happy with the treatment plan and predicted results, we can arrange to progress with treatment. Placing your implants is a short procedure. You’ll have a local anaesthetic to numb your mouth so you remain comfortable. If you have some of your own teeth, your dentist will prepare them for crowns or veneers, according to what you’ve agreed in your treatment plan. You’ll have temporary teeth to wear for the next few months while your implants stabilise.